Kenneth ‘Bam’ Alexander has played for just about everyone in the industry. He’s toured with a countless number of artists in all genres and leads workshops locally in his community. He’s been playing drums for over 20 years… since the tender age of 2 and has certainly been through the “school of hard knocks.” Bam knows both worlds – how to read sheet music and most importantly, how to play by ear. How to play ultra-advanced fills, stroke-for-stroke! Bam repeats himself plenty of times and takes these advanced fills slow enough for anyone to catch on! Master the art of “crossovers” and how to enhance your grooves and fills by using them in the right places. Diversify your playing by learning gospel, jazz, funk, rock, and Latin grooves… all broken down, step-by-step. Improve your bass pedal speed: Techniques and tricks that you can use to double your foot speed right away. The Art of Soloing: How to “wow” audiences by incorporating a plethora of rhythms and tricks. Never play the same thing twice (… or get caught for that matter)! Cross-stick techniques and when to use them during live performances. 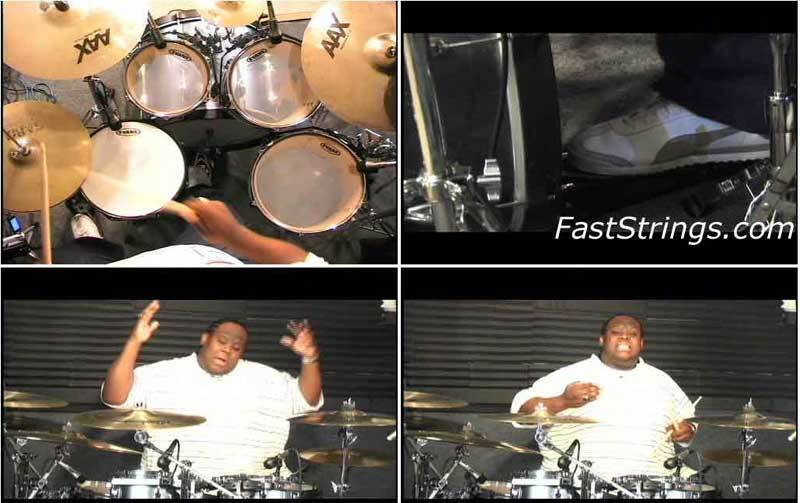 Gospel playing: How to play uptempo shouting music on the drums. Master hi-hat and ride cymbal techniques: When and why to play on the bell of your ride cymbal (especially during uptempo beats). Unique usages for the “triplet” and why it’s so powerful when used in various situations. Rim shot secrets: What most musicians don’t understand about rim shots and how to use them appropriately. Advanced “licks” and “tricks” that only experienced drummers should try to imitate. Thank you very much!!!! That’s a GREAT DVD!!!! Finally, a real Gospel Drums video!!!!! muy bueno gracias por tanta informacion ! Thank you, my grandson really enjoys this.